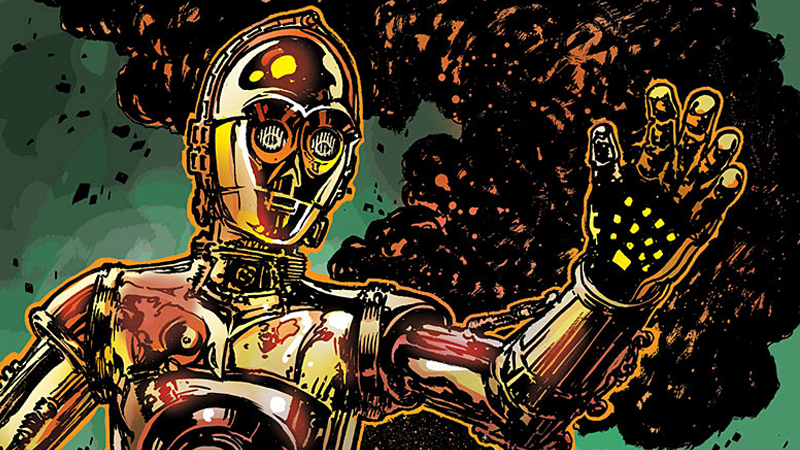 Spoilers ahead for Star Wars: C-3PO #1, by James Robinson, Tony Harris, and Joe Caramagna. Actually, to be fair, we’ve actually known ever since the Force Awakens visual dictionary guide book came out why Threepio’s arm is red. (The book had some other interesting facts in it, too.) C-3PO wears it in memory of a droid that sacrificed itself to save him during a mission for the Resistance. Pretty boring, and yet, Robinson and Harris manage to weave a fascinating tale around this rather humdrum factoid. The premise is relatively simple. C-3PO and a rag tag group of Resistance droids, as well as their captive, a First Order RA-7 protocol droid named Omri, crash land on an unidentified planet, their human crew wiped out. Omri has information on where the First Order are keeping a captured Admiral Ackbar, information the Resistance needs to save the venerable Mon Calamari from execution. (But it’s... wait for it... a trap!) After locating a working distress beacon on the planet from a downed TIE fighter, C-3PO and his motley crew trek their way over the planet in a race against time. And then all of them, save for Threepio, die horrible pointless deaths, and Threepio is down an arm. But C-3PO #1 becomes, if you’ll pardon the cliché, about so much more than the end point of C-3PO having a red arm, and that’s mainly thanks to Omri. Robinson and Harris paint Omri as a bit of a droid Nihilist throughout the issue—he questions why the droids have a concept of one side over the other, or whether they’re even capable of human qualities, like bravery or sacrifice. Most importantly, Omri also focuses on the rarely-discussed, but often uncomfortable, willingness the denizens of the Star Wars galaxy have when it comes to wiping a droid’s memories, just as Bail Organa did to C-3PO after the events of the prequels. Omri argues that, as a protocol droid, the extra sentience he is given to perform his duties makes him question the tragedy of a droid’s lot in life—awareness that makes him realize he has lived lives many times over, that who he is as a being has been re-written and re-programmed again and again. Omri’s initial distaste for C-3PO doesn’t come from the fact that they’ve been programmed to be on opposite sides of a war, but C-3PO’s blind acceptance that his sentience and memories are in hands other than his own. At one point, rather pointedly, he even refers to it in a similar manner to the concept of having a Phantom Limb, the gnawing thought of something being there when it isn’t. There’s a line later on in the issue, when the Droid herd has been thinned down to just Omri and Threepio, where the First Order droid wonders whether their fallen comrades were in their “first lives” or not—noting they were all far newer models than Threepio or himself. And suddenly, everything that had happened in the comic up until that point is reframed in a horrifying perspective. The callous disregard as little by little the group is taken down—one droid staying behind to be destroyed by hordes of giant spice spiders, another trapped in quick-sand-esque oil, dragging it into the swampy deaths, or a third that is simply carried away to their doom by fly-like creatures—suddenly takes on an altogether darker tone. You suddenly start thinking of them less as droids and more as people. The pointlessness nature of their deaths is suddenly tragic. and yes, the moment C-3PO actually loses his arm because strangely visceral and brutal. And in the end, it makes Omri’s sacrifice, his evolution from nihilistic to courageous, weirdly heartbreaking. Sheltering from acid rain that will soon destroy both of them, Omri chooses to give the data that he’s been storing to Threepio and walk out into the rain to activate the distress beacon, knowing it’ll destroy him, but save Threepio. And as it does, the acid peels away his shiny exterior, literally revealing a past life where he was painted red. It’s amazing, but Robinson and Harris managed to take this otherwise boring revelation and turn it into a fascinating insight into the nature of droids in Star Wars, painting our relationship with them as characters in a whole new light. It’s a light that, when Threepio reflects upon his journey in the final moments of the issue, is surprisingly poignant when he quietly acknowledges that he’ll keep Omri’s arm for a while. That said, I honestly didn’t realize until yesterday that C-3PO got his normal arm color back by the end of The Force Awakens. Maybe he didn’t care that much about Omri and the crew as much as C-3PO #1 makes out. Still, at least this comic put more thought into that arm than The Force Awakens ever did.